Disease: When trees get infected by a disease, the whole tree eventually becomes infected and this causes the tree to wither and die. Location: Large trees can poise danger should a dead branch fall. 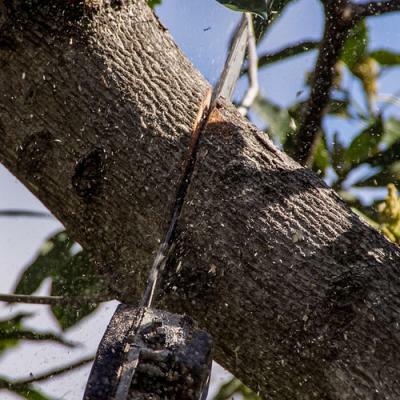 During a storm preparation, if a tree is on a location which could cause damage when it falls by itself, homeowners would opt to cut down the tree instead. Landscaping: In this case, homeowners simply wish to change the layout of their landscape. 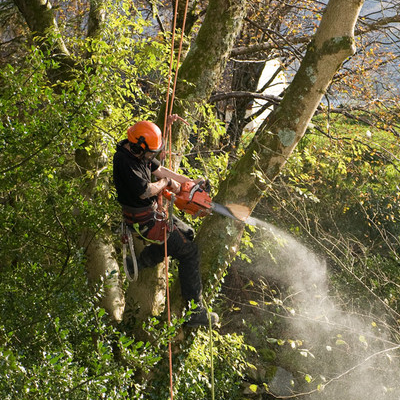 Removal of trees is a primary function of our business. It is the most complex and tedious job that we handle. 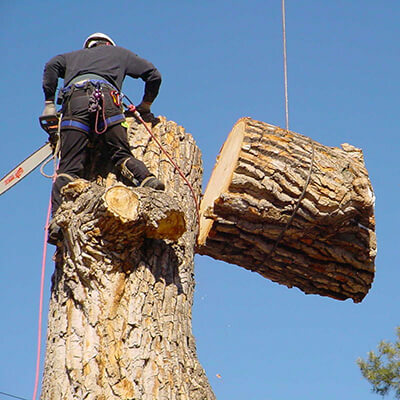 The removal of a tree may seem simple but to ensure the job is done well, we use skilled and experienced workers to do it. Type and size of the tree. Nearby structures and property, which may be affected by the job. Thereafter, we will discuss the quote and schedule the job with you then ask you for additional instructions and what becomes of the wood. On the day of the appointed task, one of our customer service representatives will call you to confirm the job and work schedule which should not exceed within a 2-hour timeframe. Preparation of the site is essential in planning how the whole project is going to be carried out. The process begins with the foreman assigning the staff individual functions. He will assign primary cutter, points of access, branch cutters, and ground crew for the cleanup. Depending on the needs of the job, heavy equipment may need to be used. However, there is always the option of doing everything manually though choosing that option is likely to take more time in completing the job. Planning involves assurance of safety for you, your property, and for our crew. We start at the tree's crown (the topmost part of the tree). Then, we start removing the main branches piece by piece. Our crew will go through the task of hoisting those big pieces of wood and stacking them away or feeding them to the wood chipper for proper disposal. When all the major parts are removed and the tree has been largely reduced in size, we will then move on to deal with the main trunk. During the entire process, our ground crew will continuously put away debris ensuring your landscape is free of any remnants from the tree. Depending on the type of tree, this will leave us with the main trunk, which would have about 10"-15" in diameter for us to remove. We will then start to cut the trunk into manageable sections making it easier and safer to remove. After the main trunk is removed, we will be left with the stump, which is about 6"-12" in diameter. Now, this is when you decide on what happens to it. Tree stumps can be repurposed as a tree stump planter where you could place potted plants on top or around it, making it a very appealing asset to your landscape. However, if you opted to have it removed, we will then begin with the stump removal process. We can use a stump grinder to complete this process but if you really don't want any heavy equipment in your property then we could just use chainsaws to finish the job. When the work is all completed, it would seem as though your yard was never touched but it would no longer have that unwanted tree.